The second entry into the Nico Giraldi series sees a shift away from the standard gritty poliziesco formula into more comic territory that would be the series bread and butter for subsequent sequels. Bruno Corbbuci's wafer thin, but nonetheless interesting, plot about Robert Webber's shady american businessman being blackmailed by some petty thieves is sadly squandered by 45 minutes of tedium following Giraldi's attempts to pick up women, feed his mouse Serpico and generally arse about doing nothing in his trademark red dungarees and stiletto shoes. 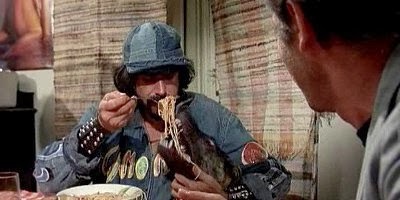 There are couple of decent action scenes, including Tomas Milian chasing a moving train on a motorbike, a couple of decent shoot-outs and a scene with a thug being beaten and murdered, but the light hearted comedy aspects, and Corbucci's listless direction, derail any tension or momentum in the plot. A comatose Robert Webber picks up a quick pay-cheque for about 10 minutes of screen time, basically playing the same role Jack Palance did in the previous film. Future entries would veer more into out and out comedy, dropping the crime angle for vaguely sketched murder mysteries.